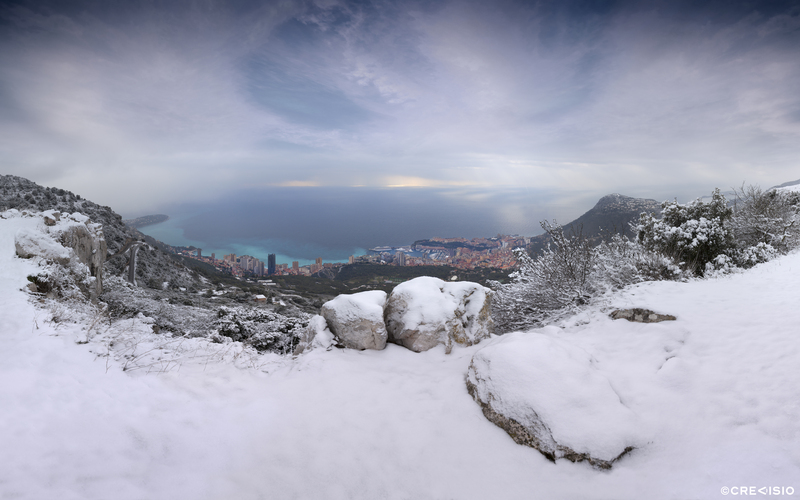 Panorama of the very rare occasion of snow falling over the Principality of Monaco in February 2018. A cold wave coming from Sibiria hit Europe during the end of February, and even reached the Côte d'Azur and the entire South of France. This ultra high resolution panorama has a full resolution of 208 megapixel (18,267 x 11,415 pixels at 300 dpi). You may download a free wallpaper version for personal use by clicking on the photo or on the full resolution link provided. For commercial use, please contact Crevisio.